My fandom has been and most likely always will be one defined in large part by substantial distance. When I was a boy, I used to fantasize that one day the great gap between me and the players I idolized would be closed. The central fantasy in what was actually a foggy cluster of vague fantasies was the one that began when I sent a letter to Carl Yastrzemski, asking for his autograph. As the months and years went by without a reply, I came to accept that a reply would never come while simultaneously fantasizing about a preposterously familiar reply: a long personal letter from Yaz, or a phone call, or even a visit. As I got a little older, edging into my teen years, my prevailing fantasy shifted to a bizarre hope that one day while shooting baskets alone on the hoop in my family’s driveway in rural Vermont, a passing limousine would slow to a stop so that its passenger, Dr. J, could (depending on how deeply I wanted to escape my life at that moment) ask me over to chat for a few minutes or go have some Burger King with him or sign me up to an NBA contract. I’m not really sure why I imagined Dr. J in the limousine and not a member of my favorite team, the Celtics, but it might have something to do with the mythic aura that surrounded the Doctor in my youth. He was a storybook figure, magical and legendary, and slipped easily (much more so than the pasty grunting lurching figures clad in Celtic green) into the realm of fantasy. I wish I could say I long ago surrendered this kind of fantasizing about the gap closing between me and my gods, but when I got married in Chicago a couple years ago I included several members of the Boston Red Sox (who I had learned would be in town that day to play the White Sox) on the invite list. I am not insane, at least not yet the kind of insane that requires a padded cell, so I did not actually expect any one of them to attend the wedding or respond to the invitations, but still I found myself at times in the customarily stressful lead-up to the Big Day imagining myself at some point during the reception leaving the spotlit side of my bride to share a few private edge-of-the-room man-to-man words with the Red Sox’ captain, Jason Varitek. Stanhouse gets my vote for most “spaced out” Dodger of all time. Thank you for all of the votes! I have been booed by 55,000 drunk, angry, rain soaked Yankee fans and there is not much you can say that will hurt my feelings. YOU SHOULD HAVE BEEN ME…….BAM! HEY JOSH WILKER….BALLS ENOUGH TO WRITE ABOUT ME…WHERE CAN I FIND YOU! 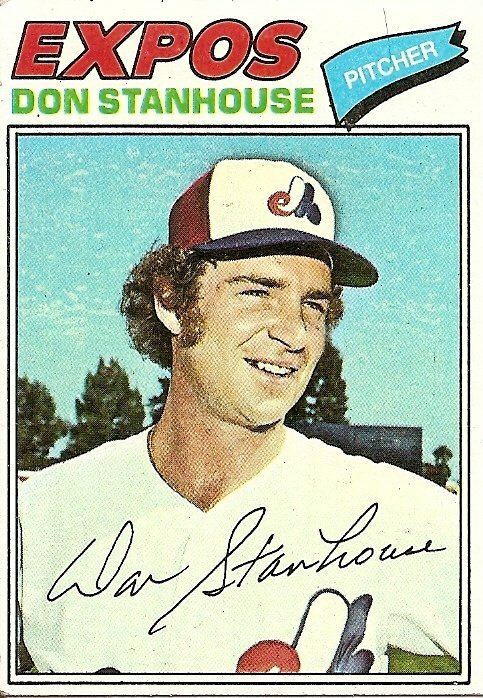 You are currently browsing the archives for the Don Stanhouse (Mon.) category.